When the news first hit that Google was buying Nest, our first thought was of the mostly forgotten Android@Home initiative. The plans seem to be a bit more complex (as you would expect), but it also sounds like Google may be shifting away from Android@Home and towards something of a Google Now@Home project. Nest announced an API today, which will give third-party developers a way to connect to the smart thermostat and smoke detector. The first set of partners announced are IFTTT, Jawbone, LIFX, Logitech, Mercedes-Benz, Whirlpool, Chamberlain, and Google. This means that various products will be able to connect to your Nest and change the temperature, like a Mercedes when it knows you're driving home, or your Jawbone when it knows you're sleeping. Of course, the one that we're all interested in will be the Google integration. Nest co-founder Mark Rogers told The Wall Street Journal that there is a plan in place for Google to connect some apps to Nest so Google will be able to know when you are home or not. The service will integrate with Google Now, allowing users to change the temperature with a voice command; and, it will let Google Now automatically adjust the temperature when it knows you're on the way home. 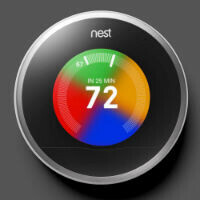 However, Nest was clear to say that Google's integration and data sharing will work exactly like any other partner. This means that users have to opt-in to allow any sharing to begin; and, Google will not get any information that other partners would get. No special treatment at all. Nest (and Google) is hoping that those two points will quiet most privacy concerns, but it does keep with the company's promise to keep the product open and opt-in. What's the over/under for how long it takes hackers to mess with thermostats and ultimately hurt/kill someone in the process?